Not many soft toys make their mark on the worlds of business and technology, but yesterday The Reg beheld “Hadoop”, the toy elephant that gave its name to the big data tool about which we've all heard so much. 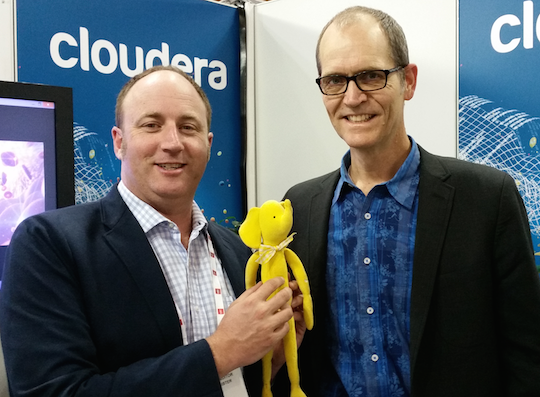 Hadoop the toy elephant appeared at CeBIT Australia in the company of Doug Cutting, one of the co-creators of Hadoop the big data tool. Cutting brought Hadoop along to the show, propping him on the lectern during his keynote and tucking him into his blazer during our chat. Hadoop once belonged to Cutting's then-five-year-old son, who invented its name. Cutting liked it so much he adopted the moniker for the software. It didn't take much prompting to get Hadoop out into the open air, but Cutting devised a rule stating Hadoop has to be photographed in the company of two others. So the shot below is not your correspondent starf*cking*, but complying with Cutting's wishes. If you look closely at Hadoop, the elephant, it has a small hole on its leg. Cutting says Hadoop, the software, also has a hole in its list of security features. Making Hadoop more robust is therefore something Cutting expects he, and the Hadoop community will prioritise in coming months. Once they do learn Hadoop, Cuttting said he expects they'll exercise it with on-premises Hadoop clusters. While elastic cloud servers appear a natural way to deploy Hadoop, he said the majority of Cloudera customers find it makes more sense to acquire and operate their own kit rather than picking servers off the shelf as and when required. Scale isn't the reason, he said. Price is. “If you're running something 24 by 7 and it is pretty large, it is cheaper to run it yourself.” Cloudera, he therefore opined, may not have picked the very best name as it turns out the cloud era is coming a little later than it imagined, at least so far as its products are concerned. *Some readers might be thinking this correspondent has a thing for shots with technology industry celebrity soft toys. 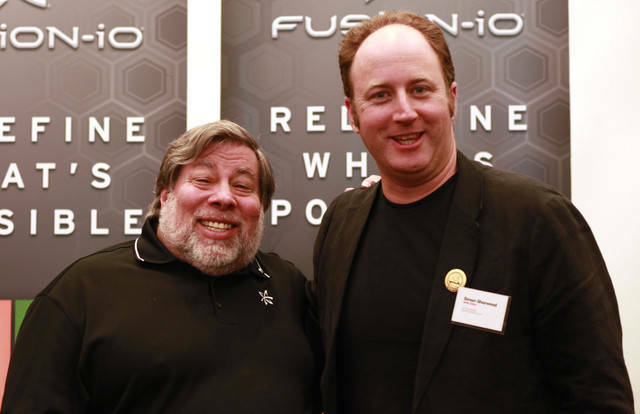 To those advancing that theory, the shot below really is Steve Wozniak. Not an Ewok.